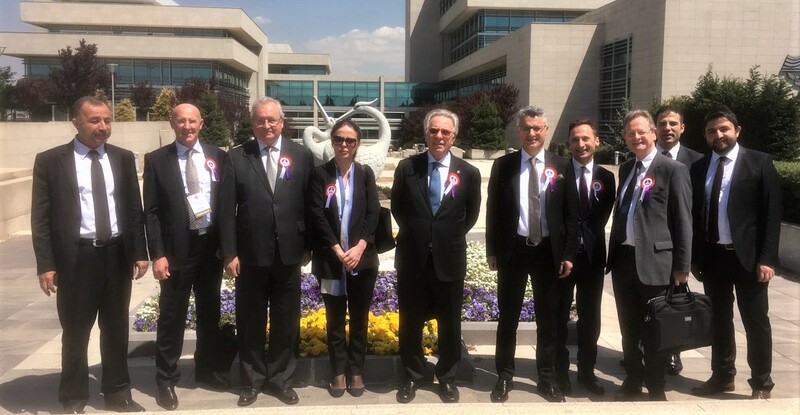 At the invitation of the Constitutional Court of the Republic of Turkey, a delegation of the Constitutional Court of the Republic of Kosovo, composed of Judge Altay Suroy and Judge Gresa Caka-Nimani, traveled to Ankara on Tuesday, 24 April 2018. The delegation of the Constitutional Court of Kosovo participated in the ceremony of celebration of the 56th anniversary of the establishment of the Constitutional Court of Turkey as well as in the international conference organized on this occasion on the topic: “Evaluation of the first five years of individual application”, which was held in the Turkish capital on 25 and 26 April 2018. During the stay in Ankara, in addition to participating in the anniversary of the establishment of the Constitutional Court of Turkey, judges Suroy and Caka-Nimani also met with the President of the Constitutional Court of Turkey, Zühtü Arslan, and with the Deputy President of this Court, Mr. Burhan Üstün. The relations between the two constitutional courts, as well as the possibilities for further deepening of mutual cooperation, were among the topics discussed at the joint meeting.